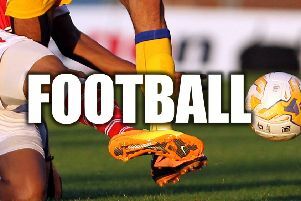 TITLE COMBATANTS Sowerby Bridge and Shelf United warmed up for Wednesday’s big Walton Street showdown with comfortable wins in the Haslem-Sheppard Halifax AFL’s top flight on Saturday. Bridge’s expected tough clash at home to a Hebden Royd Red Star side having a fine season turned into an anti-climax when the visitors turned up with nine men and were beaten 9-0. Shelf United, who have four points fewer than leaders Bridge from three games less, laboured to a 4-1 win away to next-to-bottom Ryburn United. Star player-boss Chris Garbutt said he had five regular first teamers missing. He had managed to drum up 11 players by Friday but three had dropped out and he’d had to collect a ninth player from home half an hour before kick-off. The Calder Valley club did, however, field an 11-man reserve side in the bottom section. Star had Tom Garland in goal and he was beaten three times in the first 10 minutes, once direct from an inswinging corner and then twice when weak shots bobbled and the ball went through his legs. At that stage Garbutt went in goal with Patrick Thomas taking over for the final third of the match. All of this made life easy for Bridge, who led 5-0 at the interval and took full toll on their visitors. Shelf United were below par at Ripponden Wood but came through with the help of an Oliver Coates hat-trick and a fine penalty save from Ethan Daly. Coates struck twice in 10 minutes towards the end of the first half, his first from the edge of the area and the second from a corner with a half-volley into the top corner. Jake Tait halved the deficit from the penalty spot shortly after half-time but Coates completed his hat-trick after about 75 minutes. Ryburn were then awarded a second penalty and Daly made a flying save when Tait sent the ball the same way as his earlier spot kick. Ben Grech sealed Shelf’s success from a ball over the top with 10 minutes left. Shelf FC are waiting to pick up the crumbs should Bridge and Shelf United falter. The reigning title holders beat a stubborn Sowerby United side 6-2 at Westwood Park. Andy Hawker gave them a fourth minute lead but Sowerby drew level two minutes later when Connor McGow rose above everyone to power a header from a Ryan Allen free kick. Shelf struck again through man of the match Alex O’Keefe scored but a Louis Brown pass sent Corey Henderson through to make it 2-2. Two goals late in the half sent Shelf into the break with a 4-2 advantage and they finally wore Sowerby down with two further second half goals. O’Keefe, Josh Hans (two) and Matthew Hartley completed the scoring for Shelf. Calder ‘76 boss Rob Kenworthy fears his side’s chances of avoiding bottom spot in the Premier are slender after his side were held 1-1 at home by Denholme United. Calder remain a couple of points behind Ryburn United with just three games against the title-tilting Shelf clubs to come. Kenworthy had targeted the game as one in which the Holmes Park side might be able to pick up a second league win of the season but said a draw had been a fair result against the third-from-bottom visitors. Calder were unlucky not to go ahead from a James Redmond ball into the box. Callum Cushing’s header hit the inside of the post and the ball bounced towards the Denholme keeper, who then tipped it onto the bar. Both teams had half chances in the remainder of a goalless first half. Calder took the lead on 55 minutes when Cushing mopped up the rebound after a James Megson effort had been saved. The equaliser came from a low corner with both sides starting to tire. The ball beat a couple of defenders and was touched in by Byron Coyle. 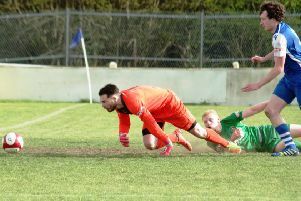 The visitors might then have snatched a win with a well struck half-volley but keeper Matt Senior somehow kept the ball out. Goals from Sam Cole, Tom McGregor, Bailey Naylor and substitute Jack Smith gave Division Two champions AFC Crossley’s a 4-0 home win over Sowerby Bridge Reserves in their penultimate game. Carlton Balmer scored four times and Jake Bradbury twice as Division Three title winners Elland United beat Warley Rangers 9-0. Flying Dutchman made it five wins on the bounce with a 4-1 win away to Hebden Royd Red Star, Martin Redman scoring twice.